Today’s parents are inundated with new solutions to help young children improve their reading ability. For parents hoping to raise a literate child, the best option may be one that’s been around for generations: the bedtime story. This article will showcase recent work suggesting that early shared reading has valuable benefits, for both reading ability and also for a child’s language development. The bedtime story has long been a carrot that tired and stressed young parents look forward to throughout their day. Like so little else in their lives, it lives up to the picture – an oasis of familial bliss that makes raising a family in today’s chaotic world worth it. What many of these bleary-eyed parents probably do not realise is that these fuzzy Kodak moments are also sparking real language development in their children. Many modern parents are turning to technology to help give their children’s language development an edge. It is clear, however, that the decidedly old-fashioned bedtime story should not be dumped into the digital trash bin. It seems to have valuable benefits for young children’s language development, and may also help their storytelling abilities and their understanding of others’ mental states. The bedtime story, or any form of shared book reading, has long been described as a vocabulary acquisition device (Ninio, 1983). More recently, studies have shown that children who start school with a larger vocabulary have a distinct advantage; and vocabulary is the best predictor of later reading comprehension (Biemiller, 2001; Whitehurst & Lonigan, 1998). In a long-term study, book reading in the home between the ages of one and three years was associated with reading comprehension at seven years (Wells, 1985). In a very large study of low-income families, frequent book reading by English-speaking mothers was related to children’s vocabulary at 14 and 24 months and to comprehension at 36 months, while the last was also true for Spanish-speaking mothers (Raikes et al., 2006). Shared reading as early as eight months, but not as early as four months, has been found to predict later expressive language scores at 12 and 16 months (Karrass & Braungart-Rieker, 2005). This suggests that parents should bring out the books before their children can understand what is being read to them, but not before the infant can sit up. The fact that reading to a preverbal infant has a bearing on later language is surprising to many of us who would have thought that shared book reading should begin when we hear the infant’s first words, usually about one year of age. Starting to read early (by eight or nine months) may also make parents more sensitive to their infants’ developing language abilities and specific vocabulary. They may then structure interactions so that they are at an appropriate level for the child (Fletcher & Reese, 2005). Most of us do read to our children. In a large American study of mostly middle-class families, 81 per cent of parents reported that they read to their two-year-olds four or more times a week (Huebner, 2000); and half of the mothers in a study of low-income families reported reading every day to their 14-month-olds (Raikes et al., 2006). But not all of us are born to be Hans Christian Andersen. Most of us need a little guidance to make our shared reading effective. In a series of studies, Whitehurst and his colleagues (e.g. Whitehurst et al., 1988) found that the key to effective shared reading was parental style. They trained parents, teachers and librarians in what they called ‘dialogic’ reading. This programme is based on letting the child take the lead through the use of open-ended questions, with adults giving informative feedback and adapting the interaction to the child’s level. In their studies, children in the adult-trained group always do better on language measures by comparison to children who are read to an equal amount by untrained adults. Even though the untrained adults are quite motivated, these researchers concluded that their reading behaviour is not optimal. So what other factors make a good bedtime storyteller? For toddlers, simple labelling has sometimes been found to have a negative relationship with their language; but this may be because it often occurs when the children do not know a word (Ninio, 1983). In another study, labelling a picture for a nine-month-old while pointing to it was related to vocabulary size in the same infants six months later (Blake et al., 1996). It is also relevant that shortly after they can sit up, infants begin to engage in what can be called ‘triadic’ communication (Adamson & Bakeman, 1984). They move from simple face-to-face communication with the adult to communication with the adult about an outside event or object. An example is reaching to request an object while looking at the adult. This sharing of attention to the outside world by parent and child is considered to be crucial to vocabulary development (Tomasello & Todd, 1983). We found (Blake et al., 1996) that more labelling occurred when parent and infant were both looking at the same picture in a book, so that parents understood that infants should be looking at the relevant picture to benefit from the label. Attention-getting statements to infants were frequent (Blake et al., 2006); and pointing, itself, may serve to recruit attention (Sénéchal et al., 1995). An example of an attention-getting statement, followed by a label, is ‘OK, look. There’s a worm’. Game-like animating activities can also be used to keep infants’ attention on the book (Blake et al., 2006; Sénéchal et al., 1995). Such animating activities include animal noises to pictures in the book and other noises, such as ‘This is how airplanes fly – wooh, wooh’. Interestingly, when young children’s eye movements are monitored while looking at the printed text and illustrations of books on a computer screen, they fixate on the pictures and not on the print. Furthermore, when the person reading the text highlights details, the children’s attention to these details in the illustration increases (Evans & Saint-Aubin, 2005). With older infants and two-year-olds, labelling may cede its importance to positive feedback, questions, and relating the book events to the child’s experience as the child’s language develops. Positive feedback is simply the next logical step to effective labelling. Instead of pointing and labelling to a two-year-old, a mother points and asks for a label (‘What’s that?’). The child responds ‘Ernie’, and mother says ‘Ernie, right’. For the two-year-olds, parental questions about the book and imitations of the children’s statements are also related to their language (Blake et al., 2006). For example, a parent reading a book about monkeys may ask ‘What do monkeys do?’ An example of imitation is that the child says ‘A big boat’, and father repeats ‘A big boat’, Since imitation is a form of feedback, these results are consistent with those of Whitehurst and his collaborators stressing the importance of open-ended questions and feedback. Parental verbalisations that relate the events in the book to the child’s experience are also found to be important for their vocabulary and the complexity of their language (Blake et al., 2006). For example, a parent reading a story about a farm may relate the story to the child’s world by commenting ‘Chickens. Look, like Grandpa’s chickens’. Not only do mothers still do the majority of shared reading, studies suggest that they do it more effectively than fathers. In a sample of approximately 100 infants from predominantly white, middle-class homes, 66 per cent of the mothers and 42 per cent of the fathers reported that they read with their infants (Karrass et al., 2003). 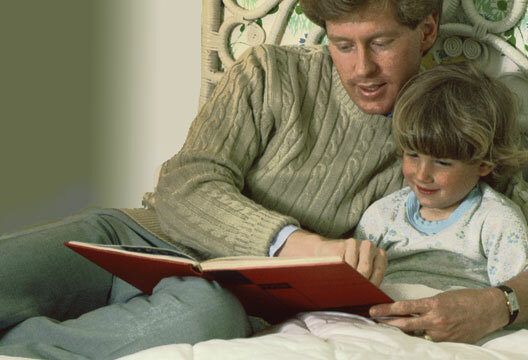 Little has been done to compare shared reading led by mothers versus fathers. But the studies there are have found few, but perhaps important, differences in their styles of reading to their children, even to very young children (e.g. Blake et al., 2006). Sometimes fathers have shown more concern with just reading the story (Conner et al., 1997), a goal which is not optimal for children’s language development. They may also ask fewer questions than mothers (Wheeler, 1983), and let their infants control the book reading situation more than mothers (Blake et al., 2006). Shared reading is not the only measure found to improve language scores. The age at which reading began, the number of picture books in the home, and the frequency of trips to the library with the child – in other words, the whole literacy environment – were also found to be key factors (Payne et al., 1994). A positive literacy environment was also more likely to encourage the initiation of shared reading by the child. Interest in reading is an important variable that has not received a great deal of attention. Two-year-old children whose parents were given strategies to encourage their interest in reading (e.g. treating reading together as a special time or allowing the child to choose the book) were observed to choose more books and to ask to be read to more often than a comparison group not given these strategies (Ortiz et al., 2001). As a result, preschoolers who display greater interest are likely to be read to more frequently (Scarborough & Dobrich, 1994). These interested readers may be girls at a younger age (14 months), perhaps in part because their language is more advanced than boys’ at this age; but the gender difference seems to disappear by the age of two (Raikes et al., 2006). Shared book reading does more than improve language skills; it also provides a context for the development of narrative skills, that is, retelling the sequence of goal-directed actions. Also, when mothers read, they often focus on characters’ feelings. As the explanations of character actions increased with children’s age from two to three, so too did the focus of children’s utterances (McArthur et al., 2005). Further, Spanish mothers’ use of cognitive or emotional mental state terms (such as ‘think’ and ‘angry’) during book reading has also been related to four- and five-year-olds’ understanding of the beliefs of others (Adrian et al., 2005). Cross-cultural differences may be an area for further research:?most Peruvian mothers when reading to their three-year-olds adopt a storytelling style in which they use informative narrative utterances, whereas most American mothers use a storybuilding style in which they co-construct the narrative with their child (Melzi & Caspe, 2005). The American children consequently talked more than the Peruvian children. Finally, sharing a bedtime story with a child may strengthen emotional bonds between parent and child, soothe an upset child, lengthen a child’s attention span, and make the child feel special after the birth of a sibling. These non-cognitive benefits need further investigation. The benefits of shared book reading with young children have been debated at length, and not all are convinced. Two meta-analyses of several studies have suggested that only 8 per cent of the range in preschoolers’ language and literacy skills is due to the frequency of parental reading (Bus et al., 1995; Scarborough & Dobrich, 1994). More recent work suggests, however, that shared book reading beginning in the preverbal months seems to have valuable benefits for young children’s language development. Adamson, L.B. & Bakeman, R. (1984). Mothers’ communicative acts: Changes during infancy. Infant Behavior and Development, 7, 467–478. Adrian, J.E., Clemente, R.A. & Villanueva, L. (2005). Parent–child picture-book reading, mothers’ mental state language and children’s theory of mind. Journal of Child Language, 32, 673–686. Biemiller, A. (2001, January). Building vocabulary: A key to reading success. Paper presented at the Norma Bossard Memorial Reading Conference, Miami. Blake, J., Macdonald, S., Bayrami, L, Agosta, V. & Milian, A. (2006). Book reading styles in dual-parent and single-mother families. British Journal of Educational Psychology,76, 501–515. Blake, J., Vetere, A. & Vitale, G. (1996, April). Shared book reading in Italian-Canadian mother–infant dyads. Paper presented at the International Conference on Infant Studies, Providence, RI. Bus, A.G., van IJzendoorn, M.H. & Pellegrini, A.D. (1995). Joint book reading makes for success in learning to read. Review of Educational Research, 65, 1–21. Conner, D.B., Knight, D.K. & Cross, D.R. (1997). Mothers’ and fathers’ scaffolding of their two-year-olds during problem-solving and literacy interactions. British Journal of Developmental Psychology, 15, 323–338. Evans, M.A. & Saint-Aubin, J. (2005). What children are looking at during shared storybook reading. Psychological Science, 16, 913–920. Fletcher, K.L. & Reese, E. (2005). Picture book reading with young children: A conceptual framework. Developmental Review, 25, 64–103. Huebner, C.E. (2000). Promoting toddlers’ language development through community-based intervention. Journal of Applied Developmental Psychology, 21, 513–535. Karrass, J. & Braungart-Rieker, J.M. (2005). Effects of shared parent–infant book reading on early language acquisition. Applied Developmental Psychology, 26,133–148. Karrass, J., VanDeventer, M.C. & Braungart-Rieker, J.M. (2003). Predictors of shared parent–child book reading in infancy. Journal of Family Psychology, 17, 134–146. McArthur, D., Adamson, L.B. & Deckner, D.F. (2005). As stories become familiar: Mother–child conversations during shared reading. Merrill-Palmer Quarterly, 51, 389–411. Melzi, G. & Caspe, M. (2005). Variations in maternal narrative styles during book reading interactions. Narrative Inquiry, 15, 101–125. Ninio, A. (1983). Joint book reading as a multiple vocabulary acquisition device. Developmental Psychology, 19, 445–451. Ortiz, C., Stowe, R.M. & Arnold, D.H. (2001). Parental influence on child interest in shared picture book reading. Early Childhood Research Quarterly, 16, 263–281. Payne, A.C., Whitehurst, G.J. & Angell, A.L. (1994). The role of home literacy environment in the development of language ability in preschool children from low-income families. Early Childhood Research Quarterly, 9, 427–440. Raikes, H., Pan, B. A., Luze, G. et al. (2006). Mother–child bookreading in low-income families. Child Development, 77, 924–953. Scarborough, H.S. & Dobrich, W. (1994). On the efficacy of reading to preschoolers. Developmental Review, 14, 245–302. Sénéchal, M., Cornell, E.H. & Broda, L.S. (1995). Age-related differences in the organization of parent–infant interactions during picture-book reading. Early Childhood Research Quarterly, 10, 317–337. Tomasello, M. & Todd, J. (1983). Joint attention and lexical acquisition style. First Language, 4, 197–212. Wells, G. (1985). Preschool literacy-related activities and success in school. In D.R. Olson, N. Torrance & A. Hildyard (Eds.) Literacy, language, and learning: The nature and consequences of reading and writing (pp.229–255). Cambridge: Cambridge University Press. Wheeler, M.P. (1983). Context-related age changes in mothers’ speech: Joint book reading. Journal of Child Language, 10, 259–263. Whitehurst, G.J., Falco, F.L., Lonigan, C.J. et al. (1988). Accelerating language development through picture book reading. Developmental Psychology. 24, 552–559. Whitehurst, G.J. & Lonigan, C.J. (1998). Child development and emergent literacy. Child Development, 69, 848–872.